Minimalist beauty exists in simplicity while Wabi Sabi aesthetics is revealed in flawed beauty. However, both of these interior decor styles share a common language that revolve around simple lines, balance and asymmetry, simplicity, organic design elements, and most importantly, intimacy. 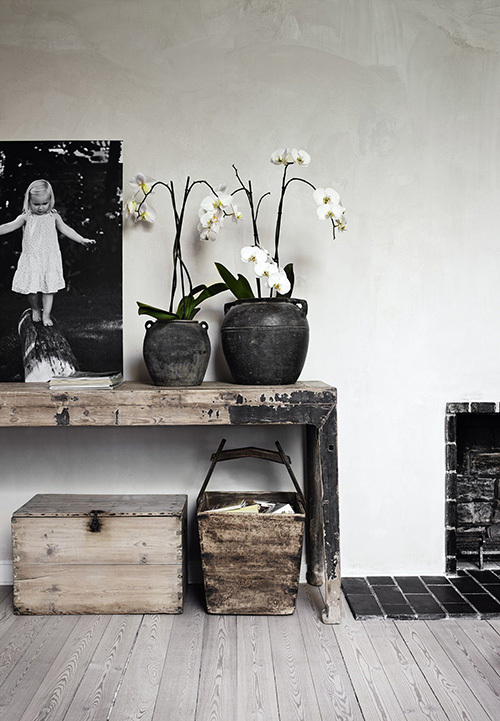 Bring a personal touch and add warmth to a minimalist home decor with Wabi Sabi influences. Think earthy colors like brown, green, gray, and muted blue. Keep it simple with solid color walls, natural lighting, and raw materials, such as wood and stone. 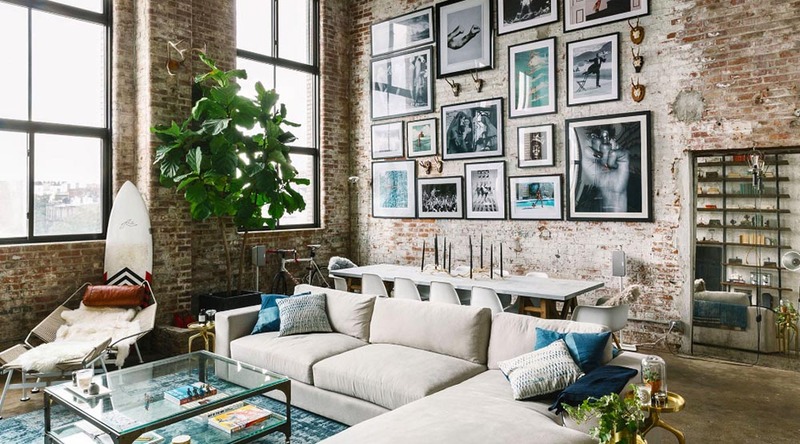 Celebrate imperfections with exposed brick walls or unfinished concrete walls. Steer clear of glossy finishes and manufactured surfaces to create an organic feel. A minimalist home decor with industrial furniture can be warmed up with earthy Wabi Sabi elements. Give a minimalist home decor a worldly vibe by incorporating carefully selected accent furniture and decorative elements. For example, you can restore old, wooden furniture (such as a table) and turn it into a statement piece for a simple room. 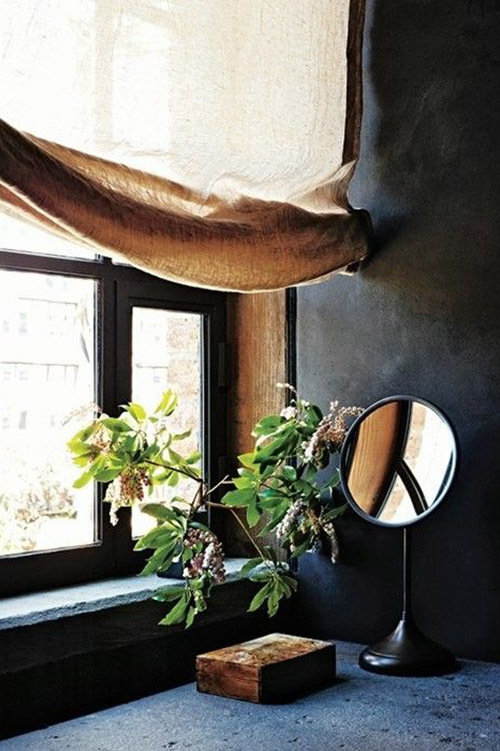 The beauty of Wabi Sabi lies in its celebration and acceptance of imperfection, so let go and find pleasure and comfort with your home as it is. Recreate a soft take on Wabi Sabi for the bedroom with soft grey, white, or muted indigo. Mix and match organic materials such as linen bedding, textured blankets, pillows in light hues, and handcrafted items such as woven baskets, restored wood dressers, or a bedside table. Don’t worry about making the bed perfectly neat and tidy. 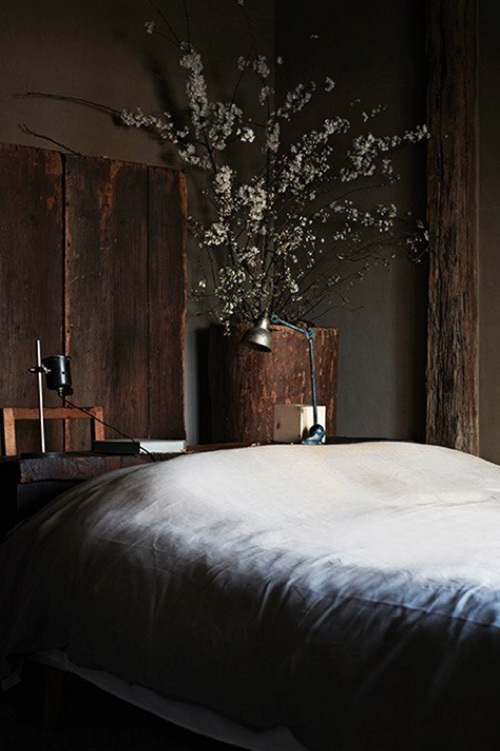 Choose loose pillows and blankets for an effortless Wabi Sabi bedroom. Embrace the “lived in” look with soft and relaxed bed sheets that may even have some wrinkles. Create a cozy bedroom with textured blankets and throws to complete the decor. When it comes to home office decor, a serene Wabi-Sabi-inspired minimalist space can help boost productivity. Keep it simple with unfinished wood furniture such as a table or cabinet. Washed out wooden plank floor tiles add a modern but rustic or aged feel. Worn out baskets and bins create interesting textures while a natural wood color can soften the contrast of a black and white room. Show off your favorite framed art pieces against whitewashed walls and take advantage of natural lighting in the room by opening curtains and windows. 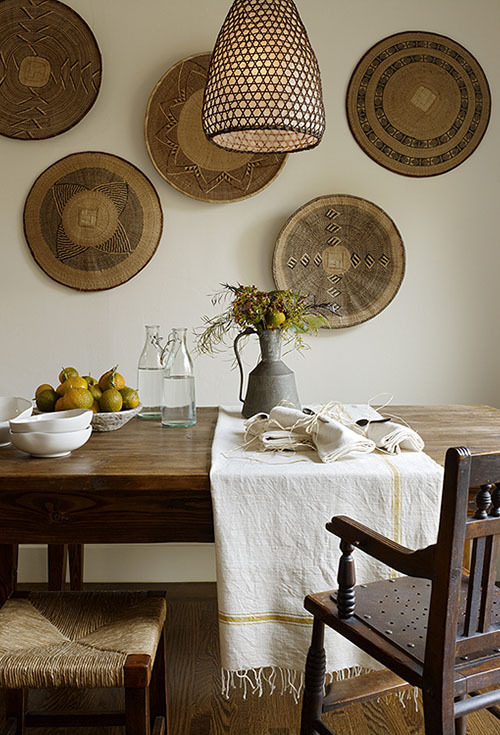 Get creative in the kitchen with organic woven materials such as natural linen tablecloths and napkins, handmade pottery or bowls, wooden cutting boards, and handwoven baskets. 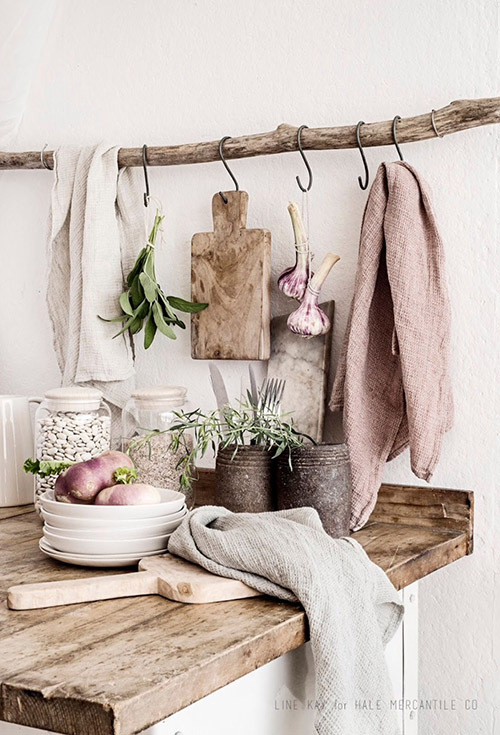 A Wabi Sabi inspired kitchen can be fun and bright yet still simple and beautiful. Mix and match jute stools with a restored wooden chair or bench. Bring life into the room with fresh or dried flowers and herbs in simple vases or tumblers. Modern rustic wooden tables look great with unfinished wooden shelves in a minimalist kitchen. Take advantage of open shelves to display your favorite Wabi Sabi plates and mugs for a uniquely refined yet humble aesthetic. 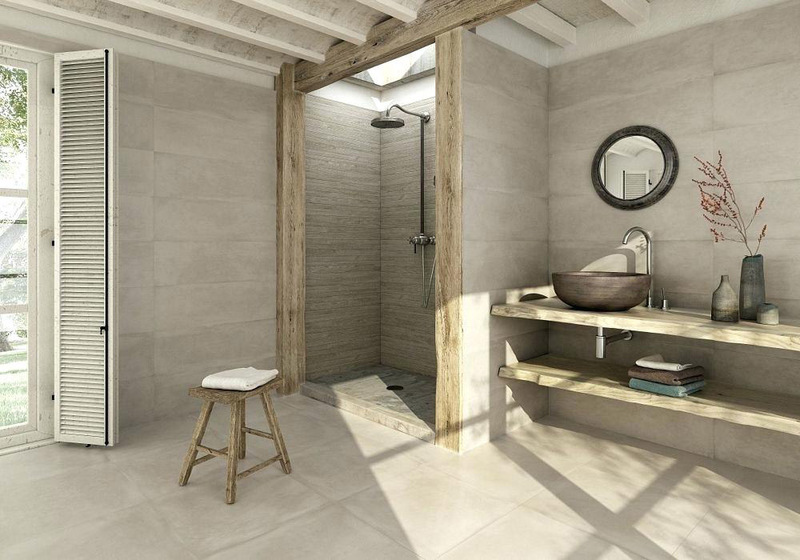 It is easy to incorporate Wabi Sabi touches in the bathroom. Start with switching out synthetic materials and replace them with organic towels and washcloths. If you have a spacious bathroom, add a wooden bench or stool in the bathroom to create a serene spa feel. Upgrade to a vessel sink and get rid of shiny or glossy finishes. Instead, opt for brushed and matte finishes for an organic feel. Tie these all together with large format stone tiles or concrete floor tiles to create a cohesive organic look in your Wabi Sabi bathroom. The keys to achieving a Wabi Sabi inspired home decor are embracing imperfections, making peace with impermanence, and keeping it simple with a neutral palette. Keep straight lines and edges to a minimum to avoid a cold modern feel and bring in the elements of nature with wood furniture, plants, and handmade items. 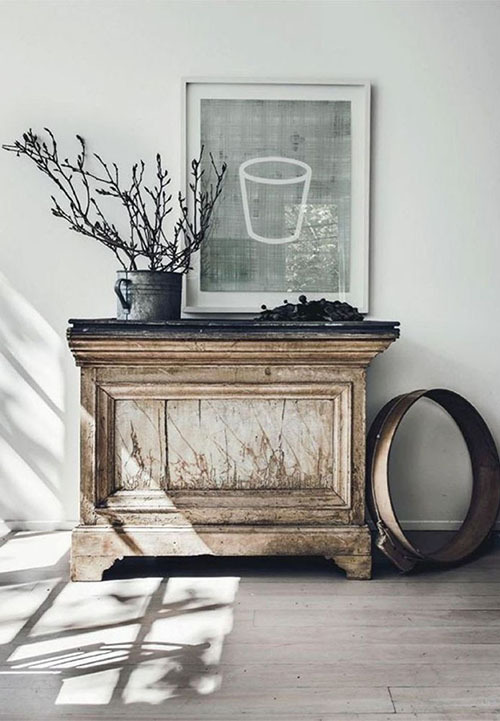 Master the art of worn out decor pieces and create your own humble luxury at home with Wabi Sabi inspirations.